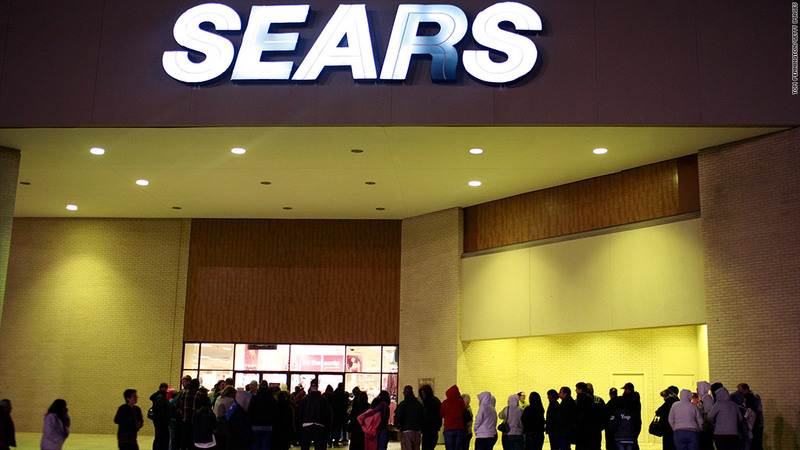 With its announcement that it will offer Black Friday deals five days early, Sears wins the coveted spot of being the first retailer to open its "doorbuster" sales. In an effort to be first to offer Black Friday deals this year, Sears announced on Thursday that customers can shop the store's "doorbuster" discounts online starting Nov. 18, five days before the retail holiday. The early deal-hunting is available for two days to members of Sears (SHLD)' Shop Your Way program, a free membership program that customers can join online or in stores. Select items that the retailer is offering on Black Friday will be available through Nov. 19 at 11:59 p.m. CT.
"We're making the search for that perfect holiday gift easier, more convenient and rewarding this season," said Imran Jooma, senior vice president of Sears, in a press release. Retailers have inched the start time to the major shopping day earlier and earlier this year. Wal-Mart (WMT) announced on Wednesday that it would get the discount shopping started just after Thanksgiving dinner, with doors opening at 8 p.m. on Nov. 22. But according to Marshal Cohen, chief industry analyst at the NPD Group, Sears' move puts it first in line. And that's a position every retailer is gunning for. "Retailers rely on the early consumer because their wallet is full," he said. "The early consumer is clearly the most profitable one and gives you longevity." Stores run the risk of consumers becoming more discriminatory and more strategic if they wait too long to unveil discounts, Cohen said. Shoppers really start to compare prices once the excitement of early deals wears off and their wallets start to thin out. It's not just start times that are competitive. Retailers from Target (TGT) to Toys R Us to Best Buy (BBY) have all unveiled price matching programs designed to bring customers in early. And Toys R Us, Wal-Mart and Kmart rolled out layaway plans and cut fees earlier than usual this year, hoping to lock in customers before they shop elsewhere. These ploys are driven by retailers' concerns that the slow economic recovery and high gas prices will make Americans less willing to open their wallets freely this holiday season. Reports are already estimating that there will be less money to go around this year. The National Retail Federation is expecting only a 4.1% increase in holiday shopping this year, while Wells Fargo said Monday it expects only a 3.8% rise. Last year, shopping grew by 5.6%.